I learned to draw flowers at a young age. You probably did too. As children, we were encouraged to make each flower an object of beauty. But what about wilted native sunflowers? Why would anyone spend time drawing such dreadful looking things? Throughout life, thousands of media images of beautiful blossoms—picture-perfect tulips, roses, sunflowers—are embedded in the circuitry of our imagination. This vast library of images can make it difficult to draw real flowers from observation. Without realizing it, we tend to draw what we imagine as a beautiful flower instead of the actual flower we’re looking at. But these withering sunflowers were game-changers. Their unappealing brownish-yellow petals and decaying sepals forced me to confront their shriveling beauty. Instead of drawing from my mind’s library of elegant, idealized flowers, I became an eye witness to the deterioration of natural form. I started to draw honestly. June 11: Beauty is in the struggle. Rescuing the native sunflowers (shown above) from the trash bin prolonged their fading life for several days. As I sketch basic shapes and relationships for their form, the two flowers appear to be leaning on each other for support. In a strange way, I’ve become emotionally concerned with their looming fate, as if sketching diligently could somehow bring them back to life. June 13: Lingering beauty, movement, and atrophy. After a couple of days, the limp contours of the petals have shifted considerably. This is when curiosity gives way to an obsession with recording the movement of flowers being starved of nutrients. To depict the progression of cellular breakdown of the petals, the freer gesture lines from my 6B graphite have been replaced by tighter, angular strokes of an HB pencil. At this point, only slivers of negative space can be seen between the drooping petals, which makes it more of a challenge to delineate contours and form. 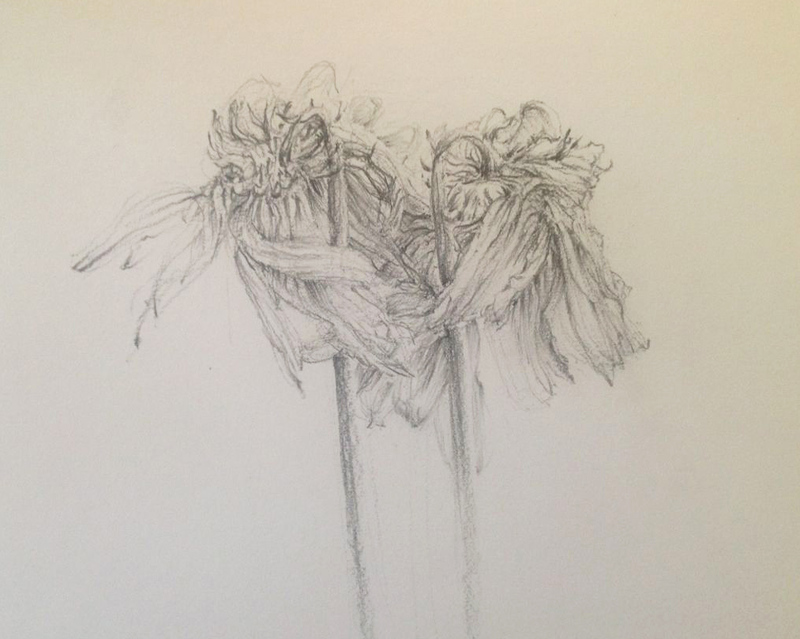 A delicate touch of the pencil captures the few remaining petals resisting the force of gravity. June 15: The harsh beauty of decay. Any traces of the blossoms’ vivid colors and idealized symmetry are long gone. Lifeless, brownish petals have completely lost their thirst for hydration. 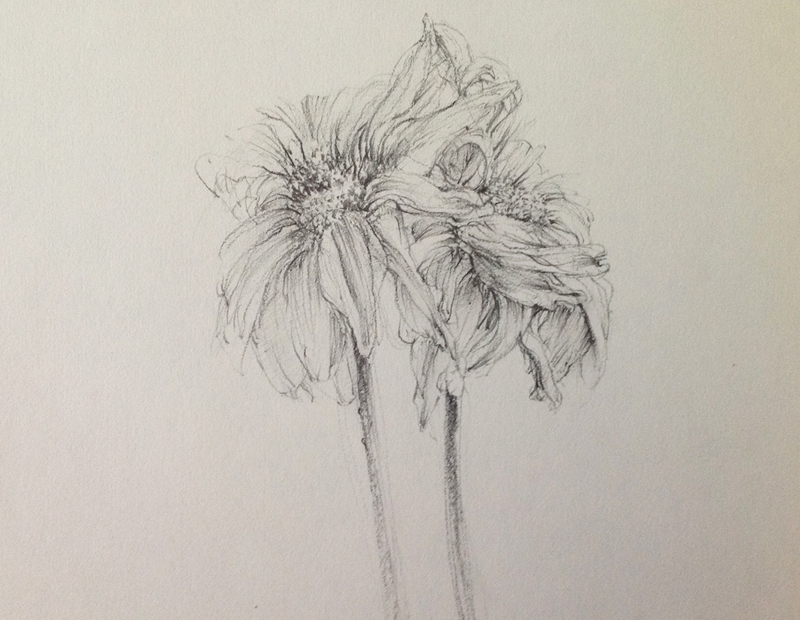 The direction of my strokes are mostly a downward rhythm to show the entangled, collapsed petals. As the chaos of decay sets in, my overlapping contour lines become a study of abstract beauty. The foundation of successful observational drawing is knowing the difference between looking and seeing. Looking at a sunflower and admiring its beauty is the easy part. But to slow down and to actually see a flower’s truer essence, even during the decline of its beauty, is the job of the drawing artist, the beholder.